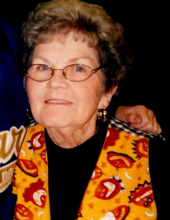 Elsie Onne Wagers Hammonds, age 80, of Hazard, KY passed away on Friday April 5, 2019 at the U.K. Medical Center. Elsie worked many jobs over the years beginning at the local dairy bar in Isom, KY to Wendy's in Hazard, KY, as well as, a volunteer at the Hazard ARH gift shop. Elsie loved sewing, cooking, working in her flower garden but most of all she loved her time with her grandchildren. She was born on April 08, 1938 to the late William Wagers and the late Pearl Bowling. She is also preceded in death by her grandparents: Sam Bowling & Rachel Wagers; three special aunts: Estelle Collins, Marjorie Collins & Flora Jean Nichols and cousin: Creva Adams. She is survived by husband: Eugene Hammonds; one daughter: Theresa Hammonds Johnson (Marty) of Lexington, KY; one son: David Hammonds (Barbara) of Hazard, KY; three grandchildren: Mary Rachel Hammonds, Marjorie Lynn Hammonds & Tate Johnson; one step-grandson: Derek Lewis; as well as a host of family and friends. Memorial Service: 7PM Monday, April 8, 2019 at Maggard's Mtn. View Chapel with Donald Pratt officiating. In lieu of flowers, the family asks that donations be made to the Humane Society. To send flowers or a remembrance gift to the family of Elsie Onne Hammonds, please visit our Tribute Store. "Email Address" would like to share the life celebration of Elsie Onne Hammonds. Click on the "link" to go to share a favorite memory or leave a condolence message for the family.